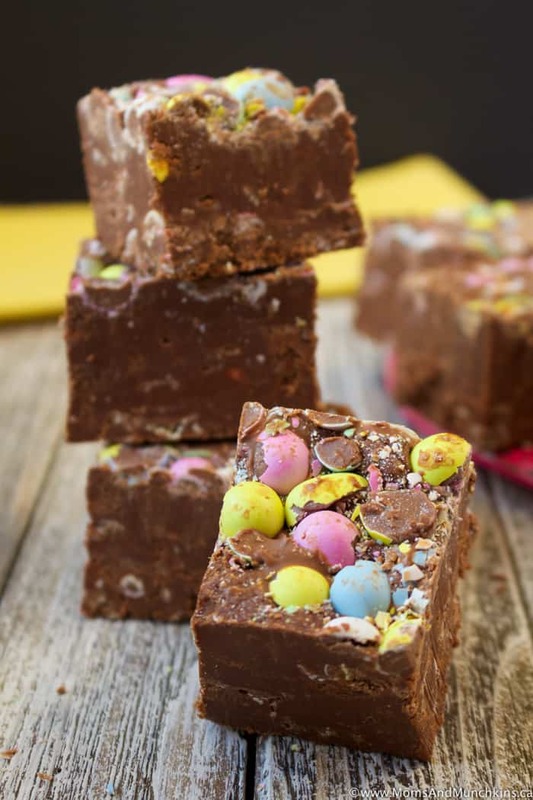 Easter may be over but with Mini Eggs now being sold year-round, you can enjoy this Mini Eggs Fudge any day of the year! It makes a great Easter dessert but is great for a birthday party too. Actually, this fudge works for any party: graduation, baby shower, bridal shower, retirement party, divorce party – ya, that’s a thing now. Ha! 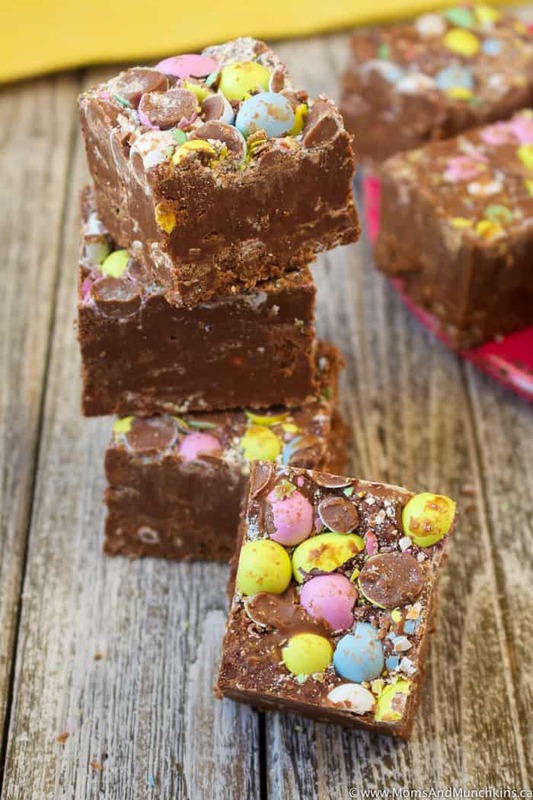 My point is – don’t wait until next Easter to try this Mini Eggs Fudge. It freezes well too so you can make some today then save a few pieces in the freezer for surprise visitors. I always have the intention of baking then saving some in the freezer for guests…but then I get hungry. I guess it’s a good thing I don’t have a lot of guests over to my home. Ha! This recipe calls for 3 cups of crushed Mini Eggs. 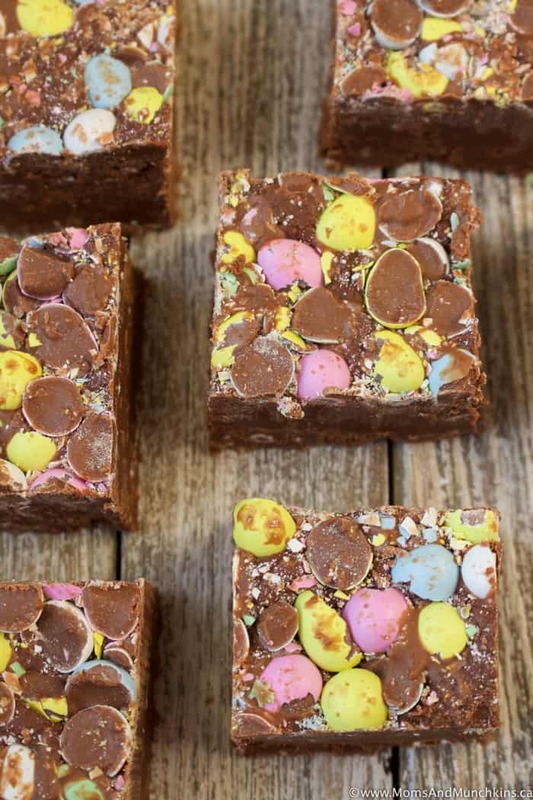 Don’t measure out 3 cups of solid Mini Eggs – you’ll want to crush them first then measure out a full 3 cups of crushed Mini Eggs. Three cups crushed is probably around 5 cups of solid Mini Eggs. To crush the Mini Eggs, place the eggs in a sealable food storage bag and crush with a rolling pin. For the 3 cups of crushed Mini Eggs, you'll want to measure this out AFTER you crush them (you'll want a full 3 cups after they've been crushed). Line a 9"x9" baking pan with parchment paper. In a large saucepan, combine sugar, evaporated milk, butter and salt. Bring to a boil over medium heat, stirring constantly so it doesn't burn. Continue to stir constantly while boiling for 4 minutes. Remove from heat then immediately pour in marshmallows, chocolate and vanilla. 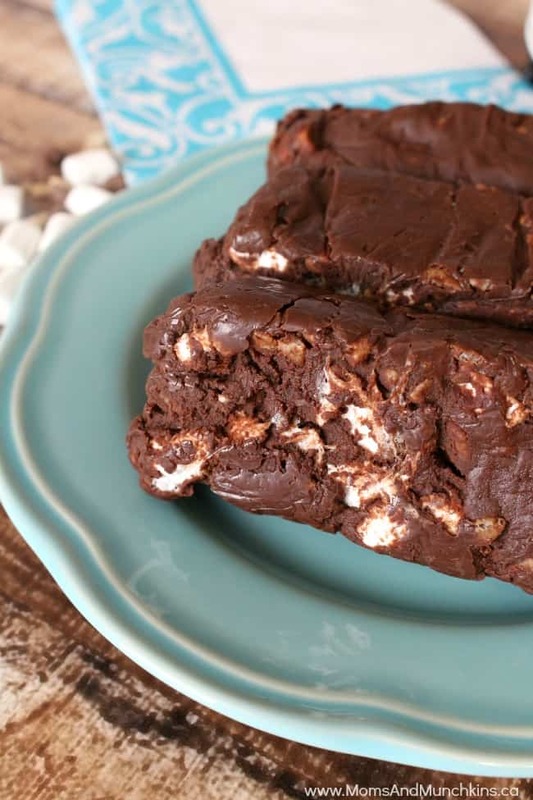 Stir until both chocolate and marshmallows are completely melted. Stir in 2 cups of crushed Mini Eggs. 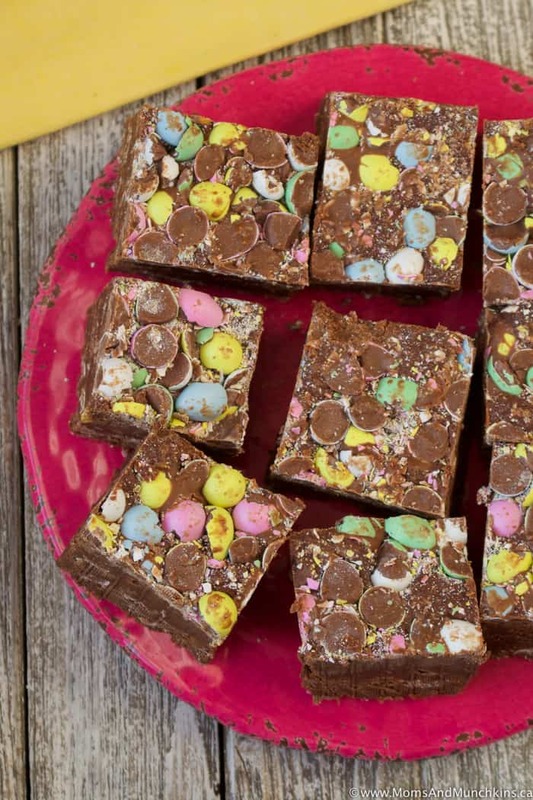 Press remaining 1 cup of crushed Mini Eggs into top of fudge. Marshmallow Crisp Fudge – a delicious fudge loaded with marshmallows and crispy rice cereal. 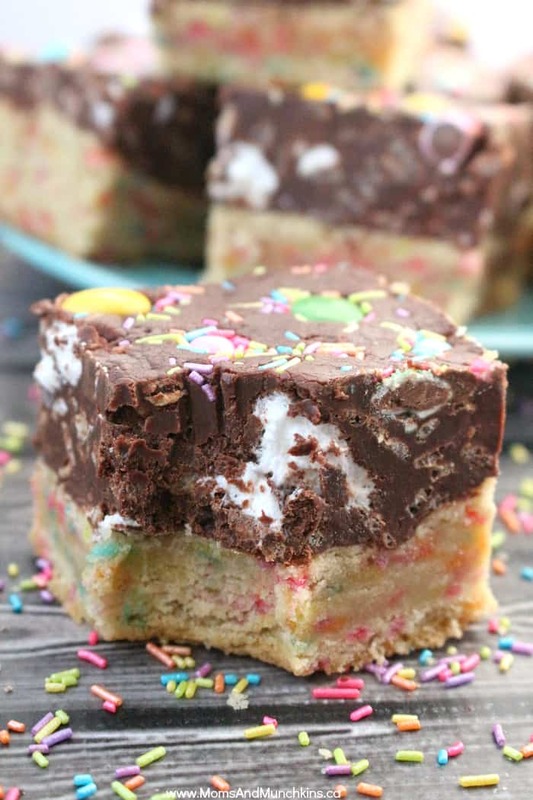 Fudge Cookie Bars – topped with Easter candies but these fudge cookie bars are great any day of the year! Visit our Recipe page for more delicious ideas. Never miss an update by following us on Facebook, Pinterest, Instagram and Twitter.